This week on the show we talked to a Super Mama extraordinaire! Emily Simonitsch sat down with us for a power hour of mentorship. Emily is the Senior Vice President of Talent for Live Nation Entertainment and is a 30-year veteran of live Latin entertainment in California, she has promoted crossover artists like Pitbull and Jennifer Lopez and is responsible for bringing us a lot of the Latin stars we know and love like Luis Miguel and Mana! She has been married for 38 years, is the mother of 2 sons and has 3 grandchildren, Errol, Kenley and Cole. She gave us great knowledge about how to climb the corporate ladder while having children, and how to navigate a long-lasting marriage. We learned so much from her life in the entertainment industry, how she prioritized her time while her children were growing up. She even gave us tips on how to find the perfect babysitter for our kids and a tip to get your kids to listen and get more involved in the decision making process. She also talked to us about her non-negotiable me time and how it helps her stay grounded. Plus Bricia shares with us her latest personal-development listens! You don’t miss this episode! Emily: I always read books every night to my kids and we also prayed every night. Bedtime was the time we used to read to them. Reading “The Family Tree” and “Goodnight Moon” are some of our favorite memories. We made it work for us since the morning wouldn’t work for us since it was too rushed. Now when i’m changing my grandkids I will hand them a book and show them stories and my son and daughter-in law pray with their own kids too! Bricia: Now my son will remember things I tell him. I always make sure to keep my promises. Talking to your kids also builds trust. If you tell them that you are going to do something just remember that your words means a lot to them. Paulina: Tips and Pick- I have the best tip for pregnancy stretch marks! Bio-oil is amazing. It has removed stretch marks I had from weight loss and has prevented new ones from coming after my pregnancies. Check out my complete list of pregnancy must-haves! Emily: Tip -Get a half-hour for yourself everyday! Do something that makes you feel good every day. Even if it’s taking a long shower and putting some blush on. Bricia: Tip - I have a life-coach and one of the things they have told me is that we shouldn’t check our phones first thing in the morning because doing that sets us up to be caught up in the demands of other people. The first thing we should do is something for ourselves and give gratitude. Pick- I love the @Wearlively line of lingerie and swimsuits! Super comfortable undergarments. You can take actually of the discount code they created for me and take 10 dollars off your purchase- Swim-Bricia. Rachel Gomez is a #badassmami and #momboss, we enjoyed sitting with her to learn about her business Viva La Bonita, a clothing line inspired by the women around her, the women who raised her and the women she continues to meet. 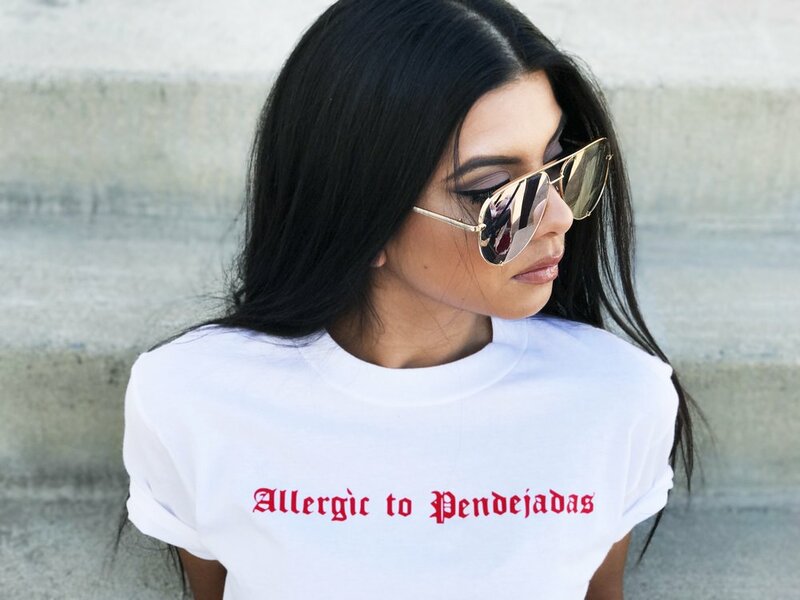 After years of being told that Latina Streetwear Brands had no relevance in the industry she has built a brand that encourages all of us to reclaim our identity and be proud of our culture. In this inspirational conversation, this first time mom talked about how her son motivated her to take more control of her life and career. She also opens up about how she dealt with building a business while having a newborn. With practical tips about how she found time to work even in those first few weeks. She also talks about how she got to know her baby, and managed postpartum anxiety. She also talks about how your passions are indicators of where your business idea can come from and how to deal with the up's and down's of motherhood and entrepreneurship. Rachel: My son recognizes the melodies we sang to him during pregnancy and now that he is getting older he is harmonizing too! We also make it a practice to visit the bookstore and let him look through books at the store. We purchase the ones that he likes and we use reading as quality time. Don't forget to share your #talkreadsing moments with us using @_supermamas and @first5california. Rachel: Don't believe everything you see online and on Pinterest. Don't pressure yourself to live life like an Instagram feed. Let's all aim to present a realistic view of motherhood and not a picture perfect version of your life. If you are finding yourself comparing your life to others then it's time to put your phone down. Bricia: I'm re-listening to Tony Robbins "Time of Your Life" program. It's a 10-day program to help you manage your time and focus your attention on your mission and to do the things in life that you really want to do. It forces us to examine the actions in our life that are going to get you the results that you want. If you are stuck in a mindset that "you don't have time" for things you want to do, I recommend you invest 10-days of your life on this. Paulina: My daughters love to play dress up! I created an area for them to play dress up and hung up all their clothes out. This has encouraged imaginative play and it has led them to have so much fun. Any extra bracelets, necklaces I find around the house I put it in their area. I got everything I needed at Ikea. Learn more about Rachel and her brand @vivalabonita and on her site www.vivalabonita.com. This week on the show we launch our Talk.Read.Sing. Campaign in partnership with First 5 California! First 5 California is an organization that educates parents, grandparents, caregivers, and teachers about the critical role they play during a child’s first five years. Since their creation in 1998, they’ve supported millions of families with programs and services designed to help more California kids grow up healthy and ready to succeed in school – and in life! We talk to Jamiann Collins-Lopez who after an extensive career in media came to First 5 California and became a mom shortly after. Since then, motherhood has continued to drive her passion to inform families about the benefits of early education and all the resources First 5 California offers. We dive into the importance of talking, reading and singing with our children and strategies to make these activities an easy part of our daily life. We discuss at what age children should go to preschool and the importance of early education whether it's at home or in a school setting. In our new segment, "Talk.Read.Sing." we share how we encourage our kids to #talkreadsing in everyday life. Jamiann shares her son's favorite books like "Magic Tree House." Paulina shares how she is enjoying reading along with her daughter Krista, and how Sabina loves music. She encourages understanding your kids’ favorite activities and tailoring your time to what they like. Bricia shares a small tidbit on how her family incorporates harmony into their everyday life. We also kick off of our Talk.Read.Sing. Challenge! Share your #talkreadsing moments with us for a chance to be featured! Use #talkreadsing and tag @_supermamas and @first5california. Check out our website supermamaspodcast.com or visit www.first5california.com to learn more. You can also find more tips and resources on First 5 California's social media channels: Instagram, Pinterest, Facebook and listen to their Pandora station. Plus! Paulina opens up about a recent health scare and how she has been dealing with the changes it will bring to her life in the next few months. Jamiann: I have an app that helps me read to my son. Audiobooks helps us read together at night and it helps him go to sleep. Bricia: Personalized books from @mumablu. You can create a story with your child's name and features. Paulina: My daughters are super into Loteria now and it's a game they play with their grandparents. You can actually pre-buy Lil'Libros new Lil' Loteria game made especially for kids. This week on the show we sat down with Ana Guajardo, she is the creator of ChaCha Covers, a line of culturally inspired nail decals that have significantly influenced the nail art landscape, and are used by nail artists locally, nationally and internationally. Ana has lived in Los Angeles for 14 years and was originally born in Mexico and raised in San Antonio, Texas. She studied Art History and Cultural Studies, from the University of New Mexico in Albuquerque as well as the University of California Los Angeles. She is a mother of two daughters, born on the same day, 9 years apart. Ana talked to us about motherhood, how Cha Cha Covers got started and how it has helped Ana make her motherhood dreams a reality. She also shared all about how she co-parented with her daughter’s father for a few years before getting back together and having a second baby! Why she is homeschooling her daughter as she approaches middle school age to allow for her to travel more. How she feels about turning 40, and this stage of her life. Hear about what she reads to stay centered. Ana-Nuk Mash and Serve Bowl - Easy, portable way to mash up baby food. Baby loves the textures and it allows you to serve them food you are eating. She also had a life tip: "9 year age gaps are not as bad as you think they are. My daughter is super helpful with my youngest." Bricia-Baby Foot Peel- A two week process that leaves your feet soft and silky. Just be aware extreme peeling will occur. You can find our guest here Instagram: @chachacovers, @culturacanvas or on her website. This week on the show we sat down with Kim-Lan Dovan an expert on all things baby and toddler transitions. She is a licensed Marriage and Family Therapist, with over 16 years of specialized experience with babies, young children, and their parents. Her background is in child development with extensive training in infant mental health. Kim-Lan has been a Wright Mommy and Me instructor for the last 7 years and has worked with hundreds of families. She is the mother of a young daughter and fondly remembers their time together in mommy and me class. She believes all new parents deserve a community where they can grow and learn with their babies. Kim-Lan’s passion is to offer guidance and support to new mothers and fathers through a mindful and informative approach as they take their first steps on their journey through parenthood. We had an interesting conversation about how to get our babies to have good sleep habits, how to balance being flexible with having a routine that benefits our kids. Paulina also talked to us about how she is preparing her youngest daughter to sleep independently when the new baby comes later this year. We also talk about various philosophies on sleep and helping them learn to self-soothe. They share tips for getting sleep through the newborn stage. Learn about the 3-day rule and how it pertains to sleep and baby routines. Remember that there is a way that works for your family and we hope that hearing various ways of doing this is helpful to you. Grab your coffee or Michelada and grab a seat there are so many useful tips and tricks in this episode! Kim-Lan currently leads mommy and me and toddler classes at The Family Room in San Marino. For more info on the Wright Mommy and Me classes/curriculum. Check out their site. Check out the HappySleeper.Com for classes via skype and consultations. Paulina: Sunscreen that can go over your makeup is life-changing. We love this one! Another tip is to put all your sunscreens in a Ziploc bag in your purse to keep them all together. Try essential oils for sleep we like Do Terra's: Serenity and lavender. Bricia: Pump before going to sleep and keep bottles with breast milk in your room. Keep your bottle warmer in the bedroom to feed the baby and take turns bottle feeding. This was easier for us than to breastfeed at night. The bottle also helped me know how much breast milk my son was receiving. Another tip that worked for me is to transition him to a toddler bed at 20 months this prevented him from ever climbing out of the crib. This week we invited Marisol Garcia, owner of Together in Birth to the show. She's a birth and postpartum doula and her company focuses on educating and empowering women and couples to achieve the birth they desire. They also provide prenatal education classes, workshops, services and guidance throughout the pregnancy and postpartum journey. In this episode you will learn what a doula does, how can they help both the Mom and her partner have a better birth experience, how do they help before, during and post labor. Why she believes that childbirth is a women's rights issue. Marisol received her doula training from Birth Goddess Midwifery, she is a certified childbirth educator, has completed traditional Mexican rebozo workshops for use in labor & postpartum and most recently completed an intense 9 month cultural postpartum course focused on traditional Mexican herbs & cerradas (closing of the hips) for the postpartum mother with Indigemama Ancestral Healing. She is also the mother of two sons. Her own birth experiences serve to inform her work and how she supports mothers in their own journey's. She shares with us her experiences as a doula and as the founder of the Latina Mothers Collaborative a group of mothers in the birthing profession who provide support and resources to other mommas. If you are expecting a baby, planning to get pregnant or know someone that is pregnant, this is a great episode for you! Learn more about our guest and her work on her website: Togetherinbirth.com or find her on Instagram @togetherinbirth. This week’s guest is Lesley Yadon, a life coach who specializes in supporting mothers. She talked to us about how to have less guilt, and more joy in our motherhood experiences. She explained to us what a life coach is and shared her strategies to help mothers care for their minds, bodies and souls during pregnancy and in the first few months of parenthood. She also shares with us how she chose this career after her own pregnancy and birthing journey left her feeling inadequate. In this honest conversation, the ladies talk about how we focus on “things” we need to buy to get ready for a new baby but rarely talk about how to prepare emotionally for the changes that motherhood brings. They discuss how they felt after having a baby and how they navigated their complex emotions. Lesley shares her strategies to manage on the top areas of concern for most mothers, guilt and worry. We also talk about specific exercises that you can start TODAY to increase mindfulness and be a more centered, and calm mother. Plus, learn more about life coaching, how it differs from therapy and why it’s a worthy investment. Paulina: My morning ritual is that I open the windows and let air in. This immediately changes the energy in the room and enhances my mood. I follow this by putting music on and that helps me get going and have the kids get ready. Light and music make a huge difference in my life. At night, I open the window and put on candles to help set the mood for sleep time. These two rituals help me transition into and out of my day. Bricia: I stretch with my baby every morning. I grab a yoga mat and we do it together. He also follows the breathing techniques. This is a great way to introduce kids to mindfulness and relaxation rituals. It’s also another way to share time together. Don't forget to follow us on Instagram @_supermamas and check out our community page for more! We are so excited to share our conversation with our dear friend Cristela Alonzo the voice of “Cruz Ramirez” in the new Disney/Pixar Cars 3 movie! There’s so much good in this episode. You don’t want to miss a minute of it! Cristela is a history maker! In 2014, she became the first Latina to create, produce, write, and star in her own primetime comedy, Cristela. You may also recognize her from her hilarious Netflix special Lower Classy. We talked to her about life lessons, broken teeth, Selena dreams and being the “good” Latina daughter. We hear the story about how the Supermamas and Cristela are almost like sisters! She shares the special message she hopes Cars 3 delivers to kids all over the country and what it feels like to be a part of such a big Disney franchise. We hear all about the Supermamas that have inspired her, including her mother and sister. Paulina also shares a story about the pressure our daughter’s face and why this movie was especially significant for her at this moment in time. Cristela drops valuable knowledge about how to deal with haters and bullies both online and in-person. You don’t want to miss how dealing with a high school bully gave her the resilience to push through defeat in her life. This is a dynamic chat you don’t want to miss. Share this episode with a friend! Paulina's Tips: Epsom salts are great for swollen feet that can happen to pregnant mom’s. Check out this recipe for Lavender epsom salts. Another tip is to make sure you have a pregnancy pillow like this one. These two things will ensure you get a good night’s sleep in your second trimester. Cristela’s Tip: Do things that you used to love as a kid! It’s a great reminder of simpler times. If you have kids it's a good way to let them see a more playful side of you. Summer Fun Tips: Plan a playdate for your kids. Create games for them to be outside and active. Remember to allow time just for free play without technology. Veronica Tolentino is the Vice-President and Co-Founder of Dude.Be Nice, an apparel company that is striving to set a new standard by inspiring people’s fashion and lifestyle. Their approach is that fashion and building community go hand in hand and she is the mastermind behind their vision and success. She is also the mother of a 13 month old child. We had a super fun comadre session with her this week! We hear her story about starting over at 30 after a 10 year career in the non-profit sector. We also dive into the transition to motherhood, and how she adapted to this big change in her life while building a business. Why sometimes it takes time to bond with your baby, and how to deal with the opinions of others. In this conversation, we talk dive into motherhood guilt, balancing it all, and the things that keep us up at night. We also learn how this busy mom keeps organized and keeps track of things and the life-changing magic of having a trusted babysitter. Paulina, also tells us about how she’s thinking about approaching childbirth differently this time around. Follow Veronica @wearingthat ,Follow Dude.BeNice @Dudebenicela. Paulina: Cartwheel Target App, will save you a bundle! This week we welcome back Gabrielle Kaufman MA,LPCC, BC-DMT, NCC a clinical counselor with over 20 years of experience in the helping profession who currently serves as the Director of Training and Technical Assistance at Maternal Mental Health Now. An organization that works to ensure mothers are receiving proper diagnosis and mental health support during pregnancy, postpartum and beyond. She is back to talk about loss, grief and how to get through a difficult time in your life, and how to be supportive to someone in your life who has lost a child. We talk about the many types of losses mothers can experience and how infertility struggles can trigger the same type of feelings as the death of a child. "We should be vulnerable and open with our friends especially during difficult times." She also gives advice and words of comfort to mothers and families dealing with a loss and shares tips on rituals and things that you can do to navigate the various emotions you are experiencing. Gabrielle shares with us what to say, what not to say, and what to do during these difficult times. Why we should resist the urge to stay quiet and avoid painful topics. Paulina: Seat of the Soul - I highly recommend this book to anyone who is seeking to learn more about the spiritual and the non-physical. If you just went through a loss this book might give you a different lens from which to analyze death. Also, Oprah read this over 30 times! Gabrielle: What Not To Say After A Loss- Don’t say “everything happens for a reason” after someone had a loss. I would always shy away from saying things like, “your baby is with the angels.” While these are well meaning things to say they will not be comforting to someone who just went through a loss. This week on the show we talk about the grief that has no name. The loss of a child. Our amazing guest Mary Carrillo reminds us that grief is not a stationary journey but that it can also be an opportunity to love harder, and live an authentic life. In 2014 she lost her son Calvin Preston. Mary talks to us about resilience and how to create a meaningful life after a devastating loss. Mary is the Founder of Calvin Preston Foundation, founded in honor of her son Calvin who was diagnosed with blood cancer and died in March of 2014. How she has embraced vulnerability since her son's passing. In this heartfelt episode, she tells us about what she felt when the Dr’s told her there was nothing left to do for her son and the moment she knew it was time to let him go. The difficult moments after his passing and the decision she made to understand his life would never be in vain. The promise she made to her son, about how she would keep his legacy alive. How she has found her passion, and her drive since his passing. We also talked to her about resilience, the decision to be happy she makes everyday. How she has dealt with loss for the last 3 years and how she has resisted the urge to lock herself away. She assures that there is beauty that lies in front of us but we must choose to find the magic in everyday, how she remains grateful for the years she had and her child. How she got to a place of more peace and acceptance. The Calvin Preston Foundation focuses on providing support for children in underserved areas who have been diagnosed with cancer. They offer assistance to families for everything from basic necessities to toys for the Holidays. The raise funds throughout the year. This includes a big toy drive for Christmas and pampering for mom's who are often primary care givers to their sick children. She also give advice for anyone dealing with grief or loss. How she took it minute-to-minute. Plus, she shares what messages brought her great comfort after losing her son. How she armed herself with the right tools to learn to live with her loss. She reminded us that there is no one-size fits all formula to deal with grief. The unexpected love that came into her life after Calvin’s passing and how she is dealing with living with grief. We know some things cannot be healed as they are just carried. She left us with great lessons in resilience, happiness and how the best way to find meaning and healing is to give back. We are so grateful to Mary for sharing her story, her son's legacy and her light with us and our listeners. Mary Posa: Writing journals help us make sense of the world and navigate complex emotions. A journal also gives us a way to feel less alone in the world. I have been journaling for a very long time. She also started a blog, Maryposa that has helped deal with her grief. Essential oils have helped her manage her emotional state and have many other uses. Paulina: La Santa Cecilia's newest album, Amar Y Vivir, with powerful vocals and the music of our grandparents is a way for us to expose our children to music they wouldn’t hear otherwise. This week on the podcast we share our favorite moments from the Super Mamas Social presented by Target. It was a beautiful afternoon of pampering for moms, fun activities for the kids, inspiring panels and amazing vendors in our Super Mamas Marketplace. We share all about one of our favorite parts of the social that actually began the day before, when Northgate Markets pampered a few lucky moms at the Langham Hotel in Pasadena. Their adventure continued the day of the social when they were treated to makeovers by Cynthia Lorraine and her team, and styling by our very own Vaya Con Fashion. Hear all about our favorite moments, the panels that made us laugh and cry. The story behind the Super Mamas Social and many more surprises including all about our Beyonce backdrop! We also loved meeting all of our mom’s, several who traveled from far and wide to attend the event. Thank you, Thank you! This was our second time hosting the event and it exceeded our wildest dreams! We loved hosting the event on Mother’s Day Weekend, so save the day for our 3rd Super Mamas Social May 12, 2018. Our guest this week is Lisa Cook founder of kidSwim water safety expert. She is a veteran aquatic instructor and coach with decades of experience teaching families to be safe and less anxious in the water. She created a developmental swim method that teaches kids to love the water at each age and stage, by focusing on specific motor/communication/sensory skill development. She believes when it comes to water safety, we should meet each child at where they are developmentally. Once they’ve gained confidence and acquired specific water skills, we can push them beyond their comfort zone. The do's and don'ts of water safety. The best age to start lessons and how many years of lessons she recommends for all children to be officially, "Water Safe." How to decide between group classes or private lessons and why we are our children's most valuable asset for water safety. She gives us insights on how to raise children who love to swim and have a full understanding on how to swim in different situations. As we prepare for Summer pool and beach time, you don't want to miss this episode about how to have fun and be safe with your kiddos! Learn more about Kidswim by visiting Kidswim.Org. or by signing up for their newsletter or find them social media @KidswimLA. Re-Usable Swim Diapers - They are better for the environment and work better than swim trunks. Chef Claudette Zepeda Wilkins is a mother of two, an all star chef and a #momhustler extraordinaire. In this episode, the #ChefMom sat down with us for an honest conversation about the challenges she has faced, her successes and her outlook on raising children. Most recently, Claudette was a contestant on Mexico’s Top Chef 2017, she currently serves as Rise & Shine Restaurant Group’s Research and Development Chef. She is behind some of the most notable restaurants in the San Diego area and has worked alongside some of the hottest names in the food industry including, Javier Plascencia. While she is currently a military wife, for years she was a single mother of two. She gets real about how she hustled to build her career as a young, single mom in a male dominated industry. Claudette is a strong advocate for women to travel and see the world even if it means taking time away from the kids. She tells us about her own "Eat, Pray, Love" experience in Morocco and how it helped her find her center and pushed her to re-shape her career. How the conversations about breastfeeding ignore the truth about many women' lives. We also talk about sexism and discrimination in the food industry and how we have dealt with it throughout our lives. We share practical advice that can be applied to any industry. Claudette shares why she rejects the conventional wisdom, "Don't be friends with your kids," and manages to be have fun with them while still being "Mom" when she needs to be. Why she is the Anti-Latina mother and actually wants her kids to leave the nest at a young age. She is a prime example of how kids can serve as the motivation to propel us to dream bigger and work harder! This episode will leave you feeling like there is nothing you can't accomplish! We also announce more speakers for the Super Mamas Social! Get your tickets at Supermamasocial.com! Have fun with your kids and learn to unplug. Even if it’s to take them for ice cream for 25 minutes without your phone. Paulina: Prenatal vitamins used to be difficult for me to swallow but this time around Nordic Naturals Fish Oil with Strawberry Coating is easy to swallow for those who have a sensitivity to the taste of pills. I highly recommend them. EPISODE 100: THANK YOU FOR 100 EPISODES! We are so excited to share our 100th episode of the Super Mamas Podcast! This week we take a walk down memory lane and talk about how the podcast has changed us, and impacted the lives of many of of our listeners. We dish about some of the guests that continue to inspire us, and what we have learned from the many experts and #Mombosses that have been guests on the show. We also talk about how the Super Mamas Social went from idea to reality. We get personal about what this podcast means to us, and our plans for the near future. We also talk about what we do for a living and how working as a family has always been at the core of who we are. We are grateful that what started as an idea for a show to talk about motherhood, has become a community of sisters from across the country that come together online, and in-person to support one another through thie journey of womanhood! We would not be here without you and we are so grateful for your love and support! Thank you for being a part of the Super Mamas Sisterhood! Don't forget to visit our community page for more great blog posts and content, including our Sister Spotlight! Don't forget to join us tonight for a 100 Episode "Ask Us Anything" Facebook Live! Check out our Facebook page for details! This week we had one of our favorite people visit us! Jacqui Saldana is back on the show to give us an update on her life and what's new in all things Baby Boy Bakery, Baby Journal and We Cook Kit. She also introduces her newest venture the Toddler Baby Journal, a special book to capture memories of your child between the ages of 1-3. She also tells us all about traveling with her daughter to promote her newest project and the many conversations she had with parents across the country at events like SXSW. The ladies also talk about the transition from infancy to toddlerhood and the different things we carry as our kids grow older. Why it's ok to do the best that we can, whether it's be a screen-mom or make your own baby sunscreen. Why Jacqui is a no-judgment mom, and why worrying about being a good mom is a sign of being a good mom. How her son inspired her first project We Cook Kit, and how she got started on this venture. A beautiful way to get cooking with your kids and build lifetime memories. How moments of stress and hurry are actually opportunities for us to bond with our children. Finally, she shares with us how happiness is choice she makes everyday and how she honors the legacy of her son everyday. See more of Jacqui and her amazing products at the Super Mamas Social on May 13th! Get your tickets today! Make A Video With Your Kids- Use the features on your Iphone to interview your kids to capture them at various stages. Journaling About Your Kids-write down memories of your likes and dislikes at various stages. Harmless Coconut Water- The BEST coconut water according to our in-house expert, Bricia! This week we sat down with Tanya Whitford is Certified Professional Organizer and owner of “Organizing Wonders.” She focuses on residential organizing and handles all areas of the home from bedrooms to home offices to garages- even inside cars. Tanya loves making a positive difference in people’s lives by helping them overcome the things that have been holding them back. Whether it is clutter, an overwhelming project, a mental block, or simply something nobody else wants to do. She also talk to us about how to keep memories, and how to know when we are ready to get rid of our past. She gives us tips about where to donate our unused items. She also tells us how to incorporate our children in the process of decluttering and how to decide what memories of theirs to keep. She is here to help us get organized just in time for Spring Cleaning! We also get an update on Bricia’s fall and the changes in Paulina’s life! Don’t let guilt be the reason you hold on to things. Keep a bag for donation in your closet and this way things won’t build up. H&M has donation program, if you bring used clothes to donate you receive 20 percent off your purchase. Buy a happy light to boost your mood, and for early risers it helps you wake up since it mimics sunlight. We are so excited to share this episode with you! We sat down with Camila Alves, a dedicated mother, fashion and lifestyle expert, philanthropist and Co-Founder of Yummy Spoonfuls. She is also the wife of Academy-Award winning actor, Matthew Mcconaughey and a former model. She gives us insights on how she juggles multiple projects with grace, while prioritizing her children, and avoiding stress. She also challenges Paulina to a life-changing experiment! We talk about raising her children ages 8,7,4, her upbringing in Brazil, and how a life of entrepreneurship and hard work continue to motivate her to work hard. She shared with us how her own struggles to make healthy meals for her children led her to seek healthy options in stores and eventually to co-found Yummy Spoonfuls and expand it to stores nationwide. She gives us tips on how to find out what products are safe for our children. But because Camila is a #momboss her work doesn’t stop there. Hear the story of how her and her husband founded the Just Keep Living Foundation after the birth of their first son, Levi. How the spirit of giving back is a core value that drives her and how her parents instilled that in her. Learn about her newest venture, her lifestyle site Women of Today and why she is excited about the power of online communities. She shares the benefits of having children close in age and how to find projects that fill your soul! Listen to the end to find out her model approved way to get ready for the red carpet! You don’t want to miss this one ladies! This woman has beauty, style, humor and candor. Find Yummy Spoonfuls at Target Store freezer aisles nationwide. Camila: Cooking: On Saturday’s I wake up early to prepare beans and dishes that I can freeze to make my life easier on weekdays. Dressing Kids: Let kids pick out several outfits the night before to avoid them going to the closet in the mornings. Bricia: Humidity in homes can lead to increased bacterial growth which could lead to more frequent illnesses. Purchase a humidity gauge to learn where your house’s current levels are. Paulina: The calm app is great for meditation but it also has breathing exercises. I go to my car and practice deep breathing and it has helped me tremendously. This week on the show we have our very first Super Mamacita guest! Wendy Carrillo is not a mom, but she is an inspirational woman, sister, and daughter. She is a journalist, activist, and is now running for Congress in Los Angeles' district 34 in a special election that will happen on April 4th. We discuss her journey as an immigrant, and her trajectory in journalism. She also talks about her activism, including her time fighting for environmental and water rights and the important role women, and mothers play in these efforts. Plus, the powerful experience that led her to run for office in the same place where she grew up. We also get back to Civics 101, and she tells us what does Congress does and why voting in local elections matters. She also gives us tips on how to raise children who love to read, and believe in themselves. Wendy's story teaches us that we can all be the change we want to see in the world and that our perspective as women, mothers and immigrants matters. To learn more about Wendy Carrillo's campaign visit her site www.votewendycarrillo.com. Find her on Instagram @wendycarrillo or on Facebook @votewendycarrillo. You can also watch the video below to learn more about her campaign. Wendy: Since she loses sunglasses often, rather than purchasing designer sunglasses, she purchases multiple inexpensive glasses at discounts stores. Bricia: Even younger children can also do chores at home. Children as young as 2 can sort laundry, help set and clean up the table. The point is to have them perform task not only for themselves but for the entire family. Empowering kids through serving from an early age is a great way to raise good citizens! We are kicking off Women’s History Month with a #momboss extraordinaire, Beatriz Acevedo founding partner and president of everyone’s favorite website, MiTú, the leading technology-driven media brand focused on creating fresh and innovative content for the mobile generation. She is a digital pioneer, Latin media expert and network approved show-runner with more than 20 years of entertainment experience, having created, developed and produced hundreds of original, primetime television shows and award-winning digital series. She is a wife, mother of 11-year old twins, and an avid cook. This woman can really do it all! She takes us through her origins growing up on the U.S/Mexico border, how she kick-started her career in media at 8 years old! Won Emmy's in her early 20's and how a chance encounter with director Robert Rodriguez led her to Los Angeles and on a trajectory that eventually led her to create her own media company. She also gets candid about her own struggles adapting to motherhood and how she deals with #momguilt. She shares what gets her through those tough moments and how she finds balance while traveling and managing her career. She even talks to us about her multi-cultural family, and how it has influenced her cooking. We were so happy that she took time out of her busy schedule to talk to us about her amazing career trajectory. Her story inspires us all to create the life we want! Calm Kids is great for younger kids. Beatriz meditates with her son every night.